Tennis elbow, also know as lateral epicondylitis, is a common condition which presents with pain on the outside part of the elbow where the muscles of the forearm/wrist attach to the bony prominence known as the lateral epicondyle. 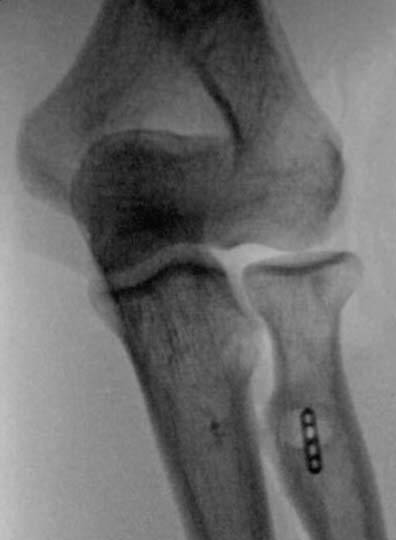 It is usually caused by ‘wear and tear’ and repetitive damage to the tendons as they attach to the bone. Golfer’s elbow is a similar, less common, condition affecting the tendons attaching to the bony prominence on the inner part of the elbow known as the medial epicondyle. Pain and tenderness over the outside (Tennis) or inside (Golfer’s) of the elbow. The pain is made worse by repetitive gripping and wrist movements. X-rays may be performed to rule out other causes of elbow pain such as arthritis. Ultrasound and MRI may be used if the diagnosis is not clear after the examination. The initial treatment for this condition involves avoiding some of the activities that cause the pain, splints and braces, physiotherapy and painkillers. A steroid injection to the affected area may also help further although the outcomes of this vary considerably. A newer type of injection known as ‘Platelet-Rich Plasma’ (PRP), where the patients own platelets and growth factors are collected with a simple blood test and centrifuged, is also an option with the most recent studies reporting promising results. If the above treatments don’t resolve the problem, surgery may be required. Tennis elbow surgery can performed as an open or arthroscopic (keyhole) procedure and includes releasing the damaged tendons and removing the abnormal tissue. Golfer’s elbow surgery is performed as an open (small incision) procedure with the similar aim to release the damaged tendons and remove the abnormal tissue. The surgery is usually successful in approximately 80-90% of patients although it can take several months to gain the full benefit. Once the elbow bandage is removed 2 to 3 days after surgery, gentle movement exercises can be started. There are no sutures to remove as they dissolve under the skin. You will be followed up 2 weeks after surgery to check that the wound has healed, at which point the exercise level can be increased. The time taken to return to work is dependent upon the type of job with most patients resuming activities by 6 weeks although it may take up to 3 months to return to full physical work and contact sports. 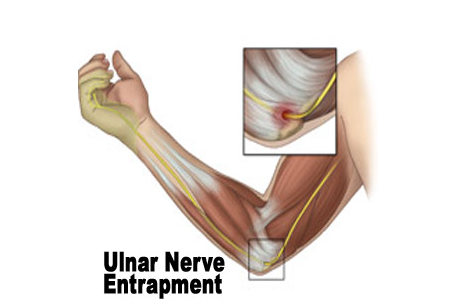 The ulnar nerve travels from the neck, down the arm to the hand and provides feeling to the ring and little fingers and controls small muscles in the hand that are important for gripping and fine control. As it passes the elbow, it runs in a tunnel (Cubital Tunnel) that can become tight and prevent the nerve working normally. Pins and needles and loss of feeling in the ring and little fingers of the hand (usually worse at night). Muscle wasting and weakness when gripping. Tapping on the nerve at the elbow reproduces the symptoms. Nerve conduction studies help to confirm the diagnosis and the severity of nerve compression. Mild symptoms may settle with the use of an elbow support and rest. If the symptoms persist, or are more severe, then a surgical release of the nerve can be performed. This involves dividing the tissue that forms the roof of the tunnel to release the pressure on the nerve and allow it to recover. Sometimes, the nerve repetitively flicks over the bone to move in front of the elbow (subluxation) – in this case the nerve sometimes has to be permanently moved in front of the elbow to resolve the symptoms (anterior transposition). Once the elbow bandage is removed 2 to 3 days after surgery, gentle movement exercises can be started. There are no sutures to remove as they dissolve under the skin. You will be followed up 2 weeks after surgery to check that the wound has healed, at which point the exercise level can be increased. The time taken to return to work is dependent upon the type of job with most activities resumed by 6 weeks although it may take up to 3 months to return to full physical work and contact sports. A bursa is a small fluid-filled sac that provides cushioning between bones and tendons and/or muscles around a joint. The olecranon bursa sits between the loose skin at the back of the elbow and the point of the elbow known as the olecranon. Usually this is flat and only has a small amount of fluid within it to allow smooth gliding between the bone and skin as the elbow moves. Occasionally it can become irritated or inflamed causing it to fill with excess fluid. This can be due to repetitive actions such as leaning on the elbow for long periods, or also associated with other conditions such as gout or rheumatoid arthritis. Recurrent swelling at the back of the elbow. Usually pain free unless knocked. If it suddenly becomes red and painful, an infection may have developed in which case you should either see your doctor or attend the hospital urgently as this requires urgent treatment. X-rays may be performed to look for associated bone spurs. Ultrasound and MRI scans are not usually required unless there is any doubt in the diagnosis and further information is required. Most patients improve without surgery by using compressive dressings and avoiding any aggravating factors. The fluid can be drained with a needle and syringe followed by using compressive dressings although it still may recur. Surgery is sometimes performed if the swelling persists and is troublesome. This involves making a cut over the swelling and removing it along with any associated bone spurs. Although this is usually successful, the swelling may occasionally return. Once the elbow bandage is removed 2 to 3 days after surgery, gentle movement exercises can be started. There are no sutures to remove as they dissolve under the skin. You will be followed up 2 weeks after surgery to check that the wound has healed, at which point the exercise level can be increased. The time taken to return to work is dependent upon the type of job although most activities can be resumed by 6 weeks. Arthritis of the elbow is where the cartilage lining the surfaces of the joint becomes thin and worn causing pain and stiffness. The two main types of arthritis are osteoarthritis and rheumatoid arthritis. Osteoarthritis is the more common ‘wear and tear’ type arthritis and usually associated with extra bone forming around the elbow known as osteophytes. These can prevent movement of the elbow and pain as they collide. It may also be associated with a previous injury or heavy manual work. Rheumatoid arthritis is less common and associated with thinning of the bones and loss of cartilage as the body’s own immune system damages the joint. Typically, many other joints are also affected in this condition such as the hands and wrists. Occasionally, stiffness may occur without arthritis, which is usually when an injury has previously occurred. Pain, stiffness and swelling of the elbow. The pain is usually associated with movement of the elbow, although if the arthritis becomes more advanced, it may cause pain at rest and even prevent sleep. X-rays are usually performed to diagnose the problem and show narrowing of the joint space and osteophytes or bone thinning. 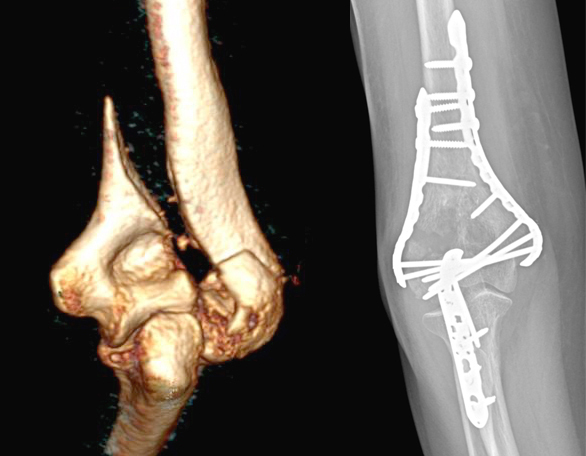 A CT scan may also be performed to obtain a 3-D view of the elbow, which allows assessment in greater detail to show the exact size and location of the osteophytes, which is especially useful when planning surgery to remove them. The initial treatment for arthritis is non-surgical and includes painkillers and resting the elbow by limiting some of the activities that cause pain. Injections of cortisone may be used to provide temporary pain relief. An alternative injection is a lubricant (viscosupplementation), which may provide a longer lasting relief from pain. Arthroscopic (keyhole) surgery – this involves removing bone spurs, osteophytes, loose fragments and scar tissue to reduce pain and allow more movement of the elbow. Open debridement surgery – this is performed in preference to keyhole surgery if the arthritis is more advanced, or the elbow is very stiff or when the bone spurs are large. Elbow replacement – this is performed for very advanced arthritis where there is severe damage to the joint surfaces and the symptoms do not respond to other treatments. The worn surfaces of the joint are replaced with artificial surfaces that remove the pain and improve movement of the elbow, although activity levels do need to be limited to minimise the risk of loosening and wearing out the artificial elbow. The period of recovery depends on the type of operation performed. Arthroscopic surgery – the benefit of keyhole surgery is a quicker recovery. Gentle elbow exercises can be started straight away to regain movement and function as quickly as possible. You will be seen in the clinic 2 weeks after surgery to remove the sutures. Most patients can drive from 2 weeks and resume all activities after 6 weeks. Open debridement surgery – the recovery is slower after open surgery due to increased swelling and muscle healing. Gentle exercises are also commenced straight away and you will be seen in clinic 2 weeks after surgery to check wound healing and assess progress. There are no sutures to remove as they dissolve under the skin. Most patients can drive from 2 weeks and resume all activities after 6 weeks. Elbow replacement – you will be placed in a plaster cast for 48 hours after surgery to rest the soft tissues. The cast is then removed and gentle elbow exercises can be started. It is important to avoid straightening the elbow against resistance for the first 6 weeks to allow the triceps muscle to fully heal. There are no sutures to remove as they dissolve under the skin. Most patients can drive from approximately 6 weeks and resume their activities after 3 months. The biceps muscle is important in providing strength when bending the elbow (flexion), for example when carrying an object, and rotating the forearm (supination), for example when tightening a screw. 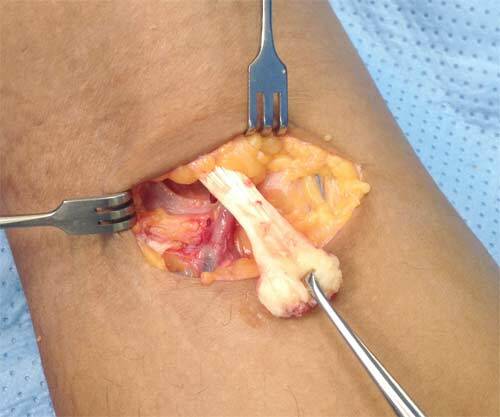 The part of the tendon that attaches the muscle to the forearm is torn off from its normal attachment to the bone (radius) in a distal biceps rupture. It usually affects middle-aged men and usually after a period of heavy lifting. Most patients experience a sudden onset of pain with a ‘popping’ sensation and a bruise developing around the elbow and forearm (the pain usually settles quickly). The shape of the biceps muscle changes as it is pulled upwards by the part that is still attached. Occasionally, a partial tear occurs where the pain persists with associated weakness although the shape is maintained. Most complete ruptures can be diagnosed after a specialist examination without any scans. Scans (ultrasound or MRI) can be performed if a partial tear is suspected or if there is any doubt in the diagnosis. Partial tears:	These are initially treated with physiotherapy and injections (steroid or platelet-rich plasma used). If symptoms still persist, surgery can then be performed to detach the damaged tendon and reattach it fully back to the bone (radius). Complete tears/ruptures:	These can be treated without surgery although will result in permanent weakness, with most patients losing approximately 20-30% of their flexion (bending) strength and 30-40% of their supination (twisting) strength. Most patients therefore choose to have a surgical repair unless they only perform minimal activities requiring minimal arm strength or are high risk for surgery. The repair involves open surgery with a small incision over the forearm just below the elbow joint to retrieve the torn tendon end, which is then reattached to its normal attachment on the bone in the forearm (radius). Once the elbow bandage is removed 2 to 3 days after surgery, gentle movement exercises (active-assisted) can be started and continued for the first 6 weeks. There are no sutures to remove as they dissolve under the skin. You will be followed up 2 weeks after surgery to check that the wound has healed. Resistance exercises and gradual strengthening can be started 6 weeks after surgery to allow the tendon to fully recover before loading the repair. The time taken to return to work is dependent upon the type of job, although heavy physical work and sports cannot be resumed until 3 months. Injuries to the elbow caused by falls, road traffic collisions and twisting injuries may result in fractures or dislocations. Swelling and bruising are seen early after the injury. 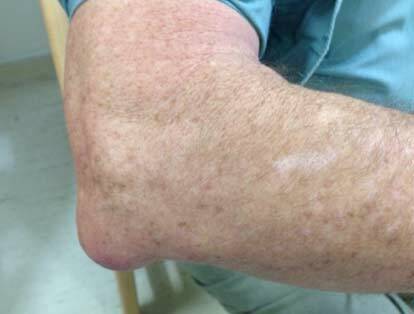 The shape of the elbow may change if there is also a dislocation. X-rays are performed to diagnose the injury and identify its pattern and severity. CT scans are sometimes also performed to obtain more information about the injury and help to plan the treatment. 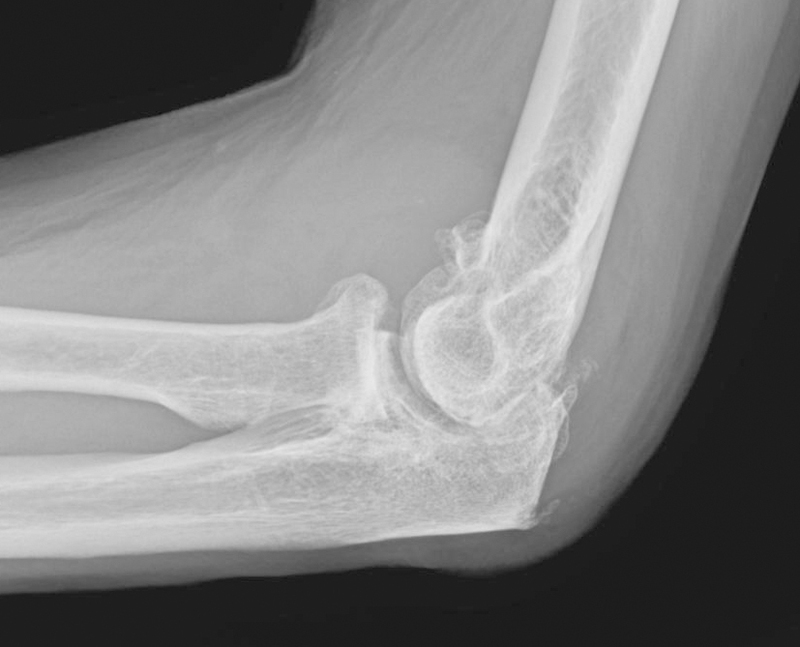 Fractures in which the bones still remain in position can usually be treated non-surgically, and early gentle elbow exercises can be started to prevent stiffness. In fractures where the bones are significantly out of position, early surgery is usually the best option, as this allows the shape of the elbow joint to be restored and rehabilitation to be started. This usually involves fixing the bone with plates and screws. In older patients with poor bone quality, fixation may not be possible, and in some instances an elbow replacement may be performed. 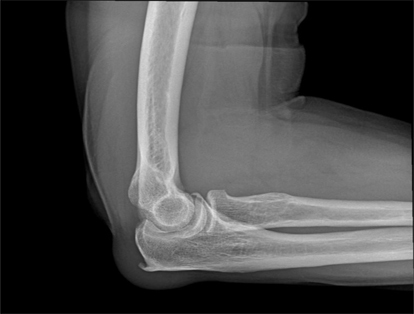 Dislocations that occur without associated fractures (known as ‘simple dislocations’) can be treated non-surgically (after reduction of the dislocation, usually in the emergency department) with early gentle elbow exercises. 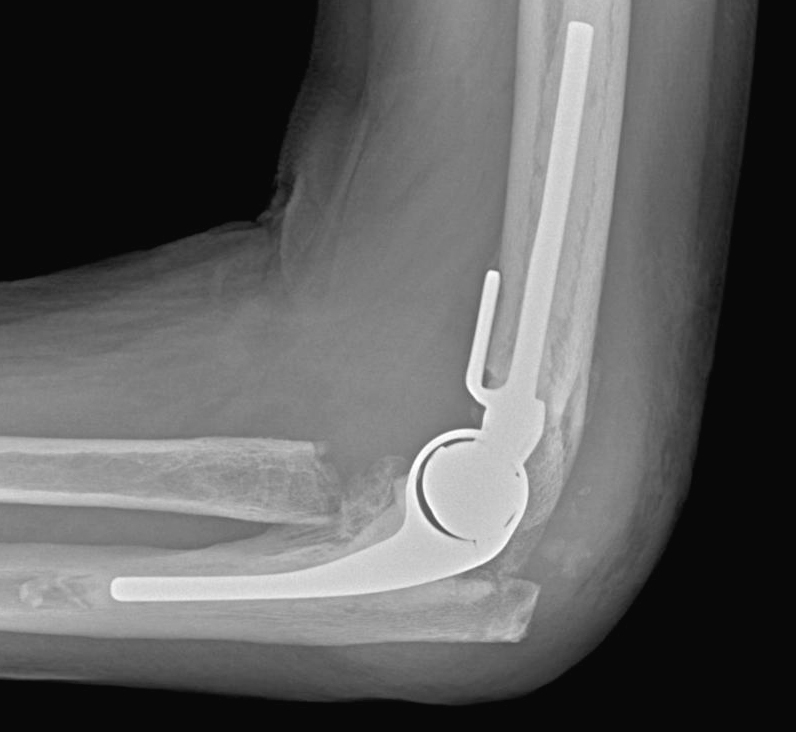 If there is a fracture with the dislocation (know as a ‘complex dislocation’), surgery is usually the best option to make the elbow stable and allow early rehabilitation. If surgery is performed, early gentle elbow exercises are usually started within a few days. There are no sutures to remove as they dissolve under the skin. You will be followed up 2 weeks after surgery to check the wounds are healing well. Resistance exercises and gradual strengthening can be started 6 weeks after surgery at which point the bones/ligaments are usually healed. Returning to work and sports is dependent upon the type of injury and speed of recovery.